With just over one million inhabitants, Köln (Cologne) is Germany’s fourth-largest city with an urban area extending for more than 405km² (155 square miles) over mainly flat terrain on both sides of the Rhine river. The city is an important railway hub and economic centre, with municipal transport company Kölner Verkehrsbetriebe (KVB) acting as the main public transport provider, while S-Bahn and other regional rail services connect the city with the wider region. All public transport operators co-operate in the Verkehrsverbund Rhein-Sieg which takes care of the integrated fare system, co-ordinated planning and marketing. KVB operates a fleet of 235 LRVs and 736 buses to serve 280.6 million passenger trips each year. Recently, the first bus route was converted to electric vehicles. As in many German agglomerations, traditional tramlines were converted to Stadtbahn standards under a process that began in the 1960s. Today, the KVB network consists of a mix of underground and surface routes and only a few sections of traditional street-running remain; due to the investment of past decades, as well as some inherited routes having more interurban character, commercial speeds are relatively high. Some routes extend beyond the city boundary, notably lines 16 and 18 which run through to neighbouring Bonn, about 30km (almost 19 miles) to the south. These are operated jointly by KVB and its Bonn equivalent, SWB Bus+Bahn. Despite changes in detail, investment in local transport infrastructure in Germany has been based on a fairly stable framework since the early 1970s. The Local Transport Financing Act (Gemeindeverkehrsfinanzierungsgesetz) established the principle of using part of the gasoline tax revenues (collected at the federal level) for local road and public transport investments. This is still the most important source of funding – usually accounting for more than half of any project costs – the remainder being borne by the relevant local authorities and, in case of public transport, the operator (also often owned by the local authorities). To qualify, projects have to show a net public benefit using a standardised assessment procedure; the outcome of this is also an important criterion for prioritising applications. For public transport, further eligibility criteria mean that the lion’s share of this funding traditionally went to S-Bahn, underground and urban LRT projects. A significant change came in 1996 when – together with other modifications in public transport planning and funding mechanisms – the majority (totalling EUR1.35bn per year) was transferred to the federal states (the largest of which is North-Rhine Westphalia). While the basic approach has been maintained, the states now have greater freedom in deciding the balance between road and public transport projects and the procedure for assessing and comparing proposals. In North-Rhine Westphalia, three regional bodies collect proposals from their respective areas and submit a consolidated list to the state government. While public entities are an important purchaser of goods and services from the private sector, other forms of private involvement in the provision of public services in Germany – especially public transport infrastructure – have traditionally been marginal. This is a key difference to countries where either ‘privatisation’ (in the sense of private risk-taking and financial participation) and/or the collection of private funding through dedicated taxation or other formal arrangements are more well-established. Germany has not been immune to global developments challenging this division of tasks, however. This was driven by two main factors: firstly, a critical view of the efficiency and effectiveness of public sector project management as part of the ‘neoliberal turn’ in the 1990s, and secondly the growing numbers of projects and an increased demand for funding. As a result, a federal law on a (partial) privatisation of road infrastructure was adopted in 1994, and several PPP schemes have since started in this and other sectors. These projects can be referred to as ‘top down’ initiatives, largely driven by the federal government and large private companies. In spite of this high-ranking support, overall take-up of the concept has been low and the question of whether these schemes actually lead to better outcomes is still under discussion. in-house provision is set to remain the dominant approach. Involvement of other private entities has been rare, but there are some experiences with ‘bottom up’ sponsorship of individual services, for example the branding of Stadtbahn route 66 in Bonn as ‘Telekom Express’ from Siegburg to Bad Honnef, and the support of retailer IKEA for feeder services to its stores. IKEA was also a key player in the Butzweilerhof project in Köln. Butzweilerhof is located in the north-west of Köln, around 8km (five miles) from the city centre and covers an area of circa 1.5km2. Before World War Two, the area contained the city’s first airport and some historic buildings remain. This was followed by military use in the central and eastern areas and mixed, largely commercial use in the surrounding zones. Starting in the late 1960s, the area became an important commercial location, with film and TV production facilities. In 2005, local savings bank Sparkasse KölnBonn moved its main offices to Butzweilerhof. The military presence was reduced in stages, and in 2005 the last part of the site was turned over to civilian use. An area of 500 000m2 was handed over to Standort Köln Immobilien GmbH (SKI) & Butzweilerhof KG, a real estate company owned by the Sparkasse KölnBonn set up specifically to develop the area. The most significant addition to Butzweilerhof has since been the opening of Köln’s second IKEA store in 2009, complemented by related shopping facilities under the ‘Homepark’ concept. About 100 single-family houses have been built near the former airport as well as some apartment blocks, but much awaits redevelopment. That said, the area as a whole is far from empty. At present, about 15 000 jobs are located there, distributed across 400 companies. The area is considered to have space for another 10 000 jobs and a total of 1800 inhabitants. KVB bus routes served the area for many years, connecting with the tram or Stadtbahn at nearby locations; only a small section in the south-east was within walking distance from the previous tram terminus in Ossendorf. As employment in the area grew, enhanced public transport provision became an increased priority in the 1990s. A Stadtbahn extension to Butzweilerhof had been included in the state’s public transport investment plan (ÖPNV-Bedarfsplan) in 1998, but before any work could be undertaken, the economic slowdown of the early 2000s and a change of government led to a re-assessment of all proposed projects. Not only was state funding reduced, but the city also decided to prioritise other LRT projects. In contrast, construction and commercial development in the area continued, leading the city and landowners to explore alternative methods of funding, described in more detail below. Once funding was agreed, detailed planning and construction proceeded quickly. Apart from a bridge over a freight railway at the start of the new 1.9km (1.2-mile) alignment, the route – with three new stops using island platforms – posed no significant engineering challenges. Initial cost estimates came to EUR26m, reduced to EUR18m through the selection of a more direct route across the former military zone and some changes in detail. Of this figure, EUR5m was secured from private contributions, the remainder borne by KVB. It is difficult to identify a clear starting date of the project, but as shown in the table on the previous page, the key period for shaping the unusual approach chosen was in the years between 2005 and 2008. Importantly, the debate among the private sector stakeholders about their contribution and the formal and technical planning work undertaken by the city’s department of LRT and bridges (Amt für Brücken- und Stadtbahnbau) and KVB took place largely in parallel, contributing to a reduced implementation time. Convincing the businesses and developers to contribute to the construction took place without a formal framework or guideline, although IKEA had experience with smaller initiatives at other sites. It was also not a single decision, but rather a process that unfolded over several stages until the necessary amount had been reached. The first body to come forward with the idea was the Forum Am Butzweilerhof, a grouping of businesses from the area which had been founded in 2004. Its mission is to enhance the image of the area and act as ‘one voice’ for the zone’s companies, also serving as a forum for discussion of matters of common interest. Both functions were important: the forum promoted the idea to the public, as well as disseminating the benefits of an LRT connection (better accessibility, reduced traffic congestion and rising land values) to potential sponsors. The SKI was a key player. As the largest single owner of undeveloped land, SKI’s interests were clear; in contrast to those already present in Butzweilerhof, its contribution would lead to a real financial return once more plots are sold. SKI realised that “project development does not stop where your land ends, you have to consider the surroundings as well”, explained manager Hartmut Raßfeld. Two other property owners stand out with their important contributions: the Sparkasse KölnBonn, as the second entity to participate, and IKEA, not only because of the size of its contribution but also in its policy in providing public transport access to all its stores, usually in peripheral locations. 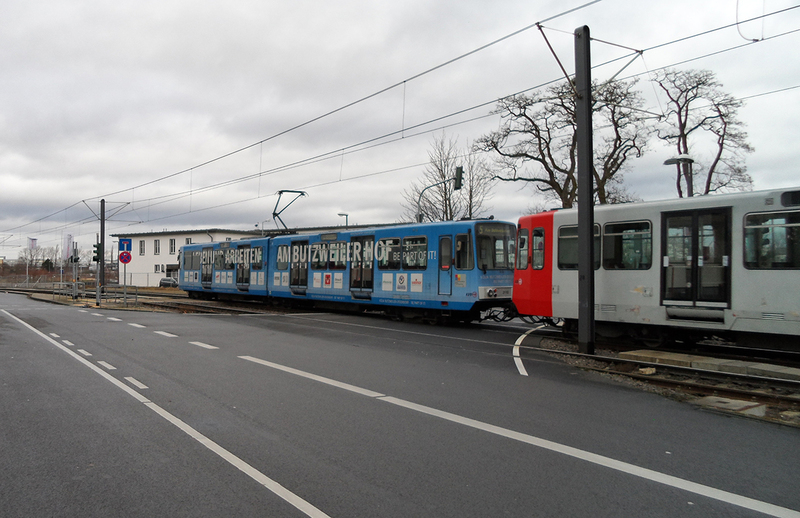 So far this had taken place through contributions to the operating costs of bus services and co-funding rail stations – Köln is the first city where an LRT service was supported. However, its choice of location was made independently from the Stadtbahn decision, and IKEA also paid a significant part of the road building works. The early decision of SKI in particular, alongside the two other two big sponsors, played a significant role in convincing a range of smaller landowners and businesses from Butzweilerhof, 39 in all, to contribute financially to the project. In the interviews undertaken by the authors, they gave both community-oriented reasons (like improving the area’s image and pride in participating in such an innovative project) as well as more tangible benefits (improved access for workers and customers and extra publicity). The latter was taken into account by KVB in the naming of the new stops and by allowing all-over advertising for Butzweilerhof on one LRV. With private sector involvement limited to financial contributions, KVB was responsible for detailed planning and implementation of the new line (choosing contractors, construction co-ordination, testing etc). This was a diversion from the usual arrangement between KVB and the city in which the former is only responsible for trackwork and rail-related equipment, with other civil engineering being the job of the city planning department. KVB also had to fund project costs not otherwise covered by the private sector; this EUR13m represented a higher share than normally covered by the operator. KVB accepted this as it considered Butzweilerhof a location with high potential that required a good service to contribute to the company’s overall income – even if KVB’s services on the whole are not profitable (as is normal for public transport). However, this greater role is also a consequence of the city’s decision to focus its resources on other schemes – both financially and in terms of planning resources. The city administration’s role in the extension was therefore limited to those tasks KVB could not cover for reasons of expertise or its legal status. The city council’s political decision to support the project explicitly obliged the operator to secure the funding without the usual state and local grants. Nevertheless, due to KVB’s position as a city-owned company, most of these costs indirectly had to be borne by the city through higher general contributions. While KVB led the project overall, securing the envisaged private sector contributions was SKI’s responsibility. To facilitate this, SKI drafted a sample agreement that was then used between KVB and the individual contributors. It was clear from the start that the scheme would not follow the classic PPP model where the private partners are involved operationally and take some commercial risk. The contract was about the provision of grants only and gave the private sponsors no further influence on the project. This framework was used for all cases except for IKEA, where a more comprehensive document also specified station naming and other issues relevant for this particular case. The Butzweilerhof project is remarkable in two key ways: the mobilisation of private capital and the condensed planning and implementation times – but could these experiences be replicated elsewhere? • A clear necessity for a different solution: faced with significant delays if the usual funding approach had been pursued, those benefactors of the project became motivated to try something else. • A critical mass of private sector stakeholders with a clear benefit from the scheme who could bring together enough resources to have an impact. • More specifically, two of them (SKI and the Sparkasse KölnBonn) committed themselves to the project at an early stage. Their contributions clearly motivated other organisations to follow. • A positive economic climate – this became evident during 2009, when little progress was made as companies feared the impact of the financial crisis. • Public sector commitment – KVB in particular believed in the project and was ready to do more than usual and spend time on developing the new approach. • Good stakeholder communication and a shared belief in the scheme’s importance were essential to speed up implementation. Many activities were undertaken in parallel and co-ordinated informally – only possible because of a common belief in the project. Almost ten years on, there are no signs of other projects following the same approach in Germany but the authors would argue that this is not due to these ‘success factors’ being impossible to replicate. Rather, it seems that the ‘traditional way’ still works well enough – especially in the current phase of prosperity. However, new challenges lie ahead: On the one hand, demand for public transport is growing in most German cities, requiring additional capacity. On the other, many cities and LRT operators are faced with the need to refurbish the infrastructure from the 1960s-80s and under the current framework, no state grants are available for mere renewals. Being creative in raising funds for such projects is therefore likely to stay on the agenda, and as part of this it is legitimate to approach those who benefit from good public transport as well. Article originally featured in September 2018 TAUT (969).